A common new year's resolution is to save money. There are a variety of ways to save and today More Than Paper is sharing 5 easy ways to save at the grocery store. For most families, monies spent at the grocery store is typically the second largest expense, with mortgage or rent being number one. Save big each month with these easy tips. #1: Stock your pantry with store-brand spices, oils, vinegars and marinades. Store-brand spices, oils, vinegar and marinades are virtually identical to name-brand ones. Compare ingredients but save big when you buy store-brand on pantry items. #2: Don't waste the food that's in your refrigerator. Make sure you freeze meats before they expire. Before bananas go bad, use them for smoothies, make banana bread or freeze them for later use. Avoid frequent trips to the grocery store during the week and make do with what's in your fridge by stretching your creativity. Use as much as possible before shopping again. Make it a game to only go to the grocery store once a week! #3: Don't forget about canned foods! Using canned foods as ingredients to your home cooked meals is a great way to save money, especially if you stockpile staples, such as canned tomatoes, beans, tuna or salmon, when they are on sale. Use canned beans in salads, as a side dish, or make your own hummus. Toss canned beans in main dishes for extra protein and fiber. Canned tuna and canned salmon also make an inexpensive lunch. Diced tomatoes are a must have and can be used in many recipes. The best part about canned foods is that they will not spoil! How many times have you bought fresh vegetables with the intent to cook a meal, only to get sidetracked and then have the vegetables spoil? #5: Go vegetarian one night a week. Plan your menu to include one meat-free night. Instead use beans, salad with lots of veggies and lentils or cook pasta. We love using our reusable personalized grocery tote while shopping. This one carries about 2 plastic bags worth of groceries and is a one-time investment that's worth every penny as it saves the environment! 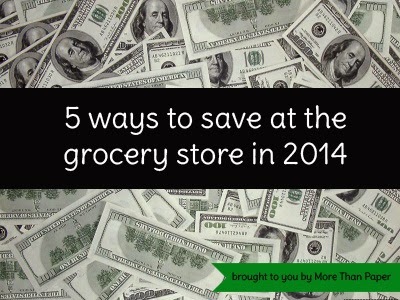 So how do you save money at the grocery store? Share your tips with us here! Try buying some staple items at Dollar Tree or 99 cent stores. They have some great deals on products that can't really go wrong.